How many of us had grand plans to reuse details? Probably most designers or organisations. This may have taken the form of A3 folders of typical details or individual PDF and/or CAD files in shared folders which are organised in some wonderful system of folders and sub-folders. How many were maintained? Likely very few. Details are rarely as typical as we think. Regulations and Standards change. Sometimes details aren't as good in practice to build as they looked on paper and changes happen that do not get incorporated into the final details. Design and Build contracts leave designers creating design intent details rather than detailed designs as some of the construction or products being incorporated are likely to change. BIM may just be the opportunity to get organised again. 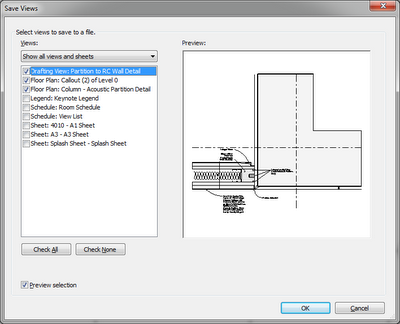 If managed effectively, Revit offers a solution which is quite effective to solving the library of details. 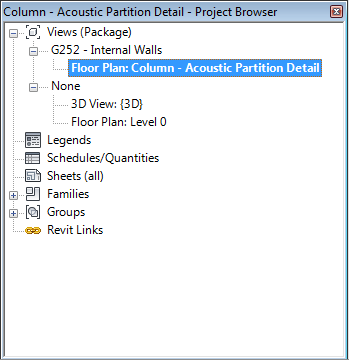 Revit provides an Insert 2D Elements feature which allows you to select a Revit project file and then presents you with a list of Callout and Drafting views only. The Insert 2D Elements from File is located on the Insert panel. 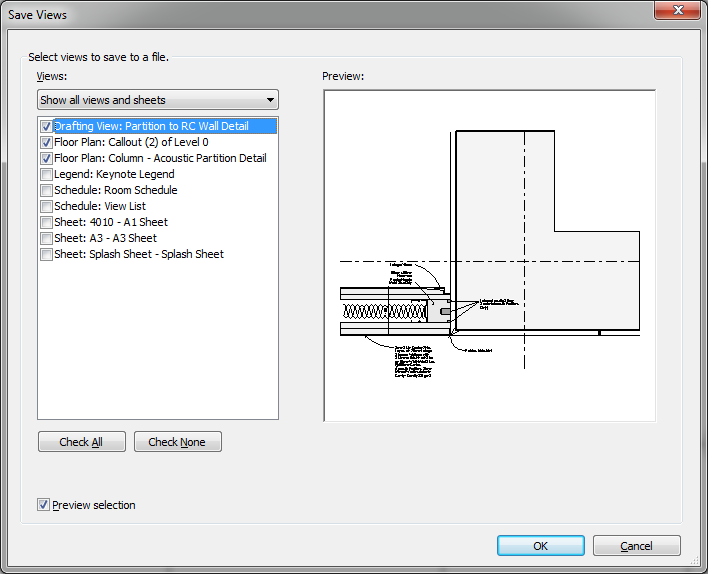 After selecting a Revit file, you will be presented with a list of Views. Not al views are presented, only the views that are 2D which are Callout and Drafting views. If you tick the Transfer view Scale box, your view will inherit the scale of the imported view which is likely what you want in most cases. All the 2D entities including lines, regions, groups, text and insulation will be copied into the current view. 3D objects will not, so you may need to do a little modification depending on how similar the arrangement of your current detail is to the inserted detail. Hopefully, eventually you will ave lots of great details. Wouldn't it be great to put them all in one place. 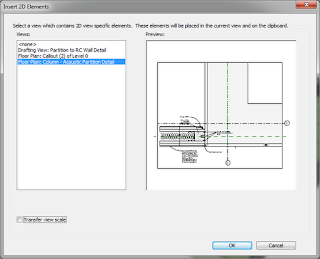 You can export multiple views to a single Revit file. Click the Application menu (the big R on the top left hand side), select Save As -> Library -> View. Note: This function can export any type of view. After selecting the Views you wish to export, click OK and select a folder and file name. If you wish to import any or all of the views, on the Insert panel, select Insert Views from File. This is a similar dialog box to export. Then select the views you want to import. A reasonable strategy here would be to export the views from a project file to a temporary Revit file and then import them back into a Revit file with all your typical details. Note: It is very important that you name your views appropriately. If you are looking through a bunch of details, detail at column is almost meaningless. Be reasonably explicit with view names e.g. 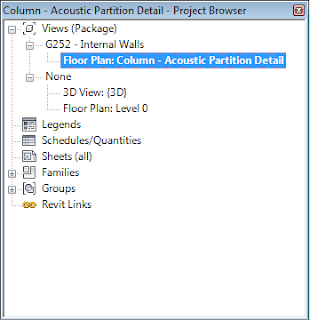 Partition to Column plan detail. 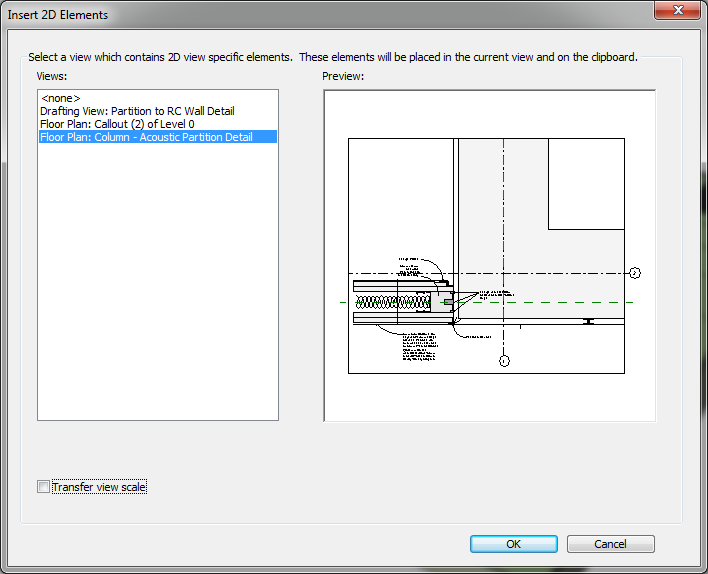 There is one more piece of functionality that Revit has that CAD does not. It is a fully formed database and you can utilise this to help sort the views in your details library. I lightly touched on project Parameters in the Title Blocks post. Project Parameters can be used to help you sort your details. 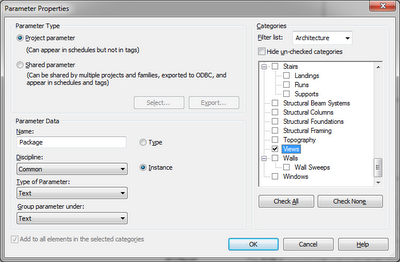 On the Manage panel, select Project Parameters. If you are starting from scratch you may have none. Click Add. 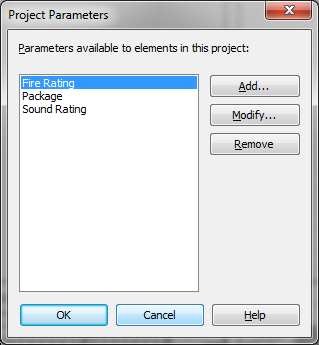 We are going to add a parameter that is of type 'Project Parameter' and it will accept text and be available to Views. Name: For this example, use 'Package' as the name. Type of Parameter: Select Text as the type of Parameter. Similar to spreadsheets or database fields, there are many different formats for the field. Group parameter under: Select Text. The group you add it to is up to yourself. This affects the category it is placed into on the properties palette and can be changed if necessary afterwards. Categories: Select Views only as the Category. This will ensure that the parameter appears in the Properties palette for Views. I have included 3 text parameters for Views. Now, remember from the first Sheets post, you can sort and filter by parameters. Try sorting by Package. You can sort by Package and then by Fire Rating or sort by Package and filter by 1 Hour Fire Ratings. The Project Parameters will be also exported using the Save As -> Library -> View so it is important that you set-up Project Parameters in you template file as early as possible. You can add as many parameters as you need, but be logical about it. Think about how you would search for details rather than how you wish to categorise them as searching is what they are being created for. A Package parameter based on a classification system is important. Use your national or governing bodies coding system e.g. Uniclass or Omniclass. You could also include parameters for Detail Status, Approved By, Date Approved, etc. in order to add a level of quality assurance. I was going to look into how you can smartly reference aspects of the 3D model with the 2D details, but I think there is enough to think about in this post. I will save it for another day. 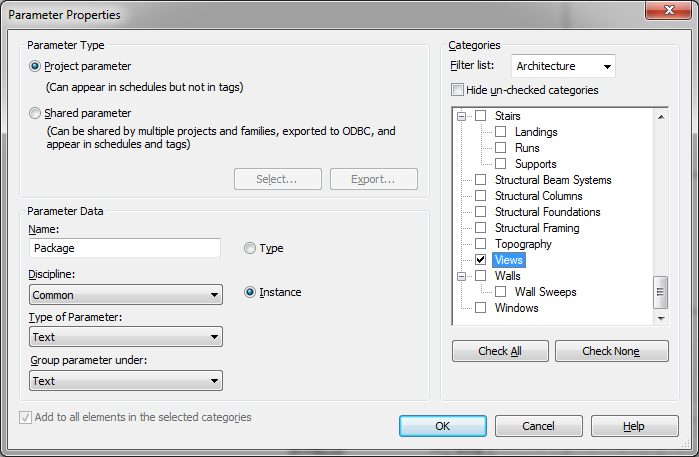 I think you will agree that there is great potential to organise your details in Revit. 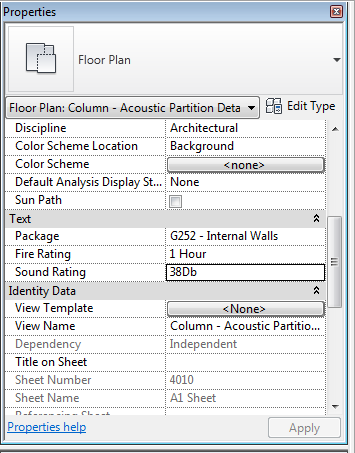 In AutoCAD, you would have had to incorporate a separate database and a bit of ingenuity to organise details so well.